Parking garage light viewed through “Night Spectra Quest” viewer. Nighttime isn’t colorful, and was even less so in the days before artificial lighting. Human color vision decreases the darker it gets, eventually reaching true black and white. However, with a spectroscope in hand, there are rainbows to be found. 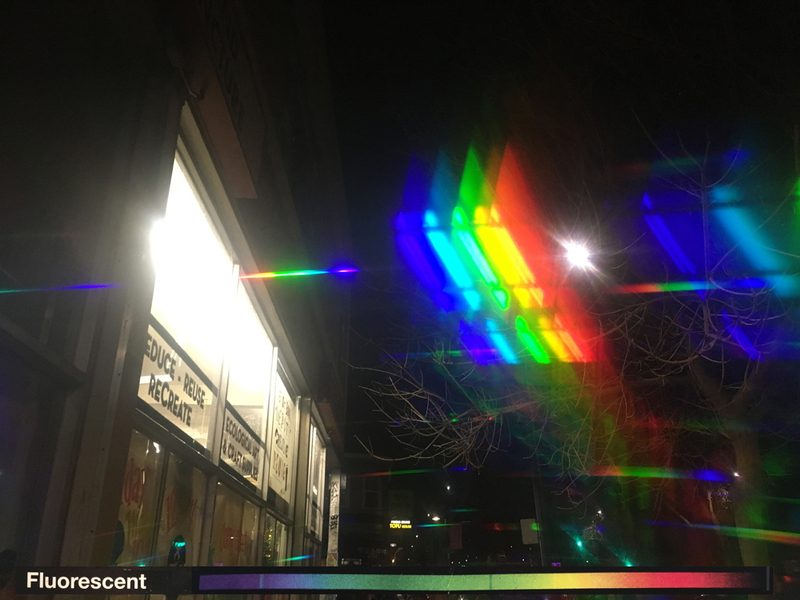 The Night Spectra Quest uses prism-like diffraction grating to break up light into colors. Hidden in each light is a psychedelic pattern encoded with information. 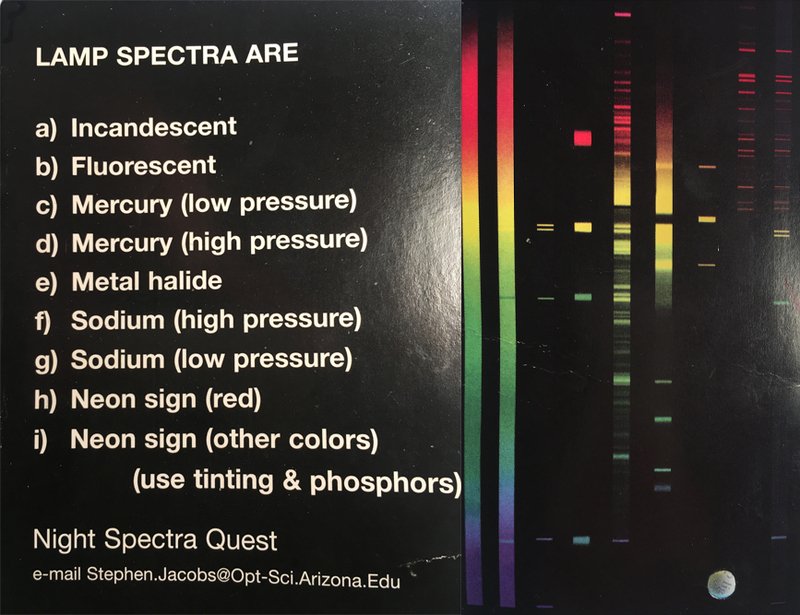 For the past month, I’ve been viewing and photographing the color within the night lights around me, all thanks to the “Night Spectra Quest” card: a $4 diffraction viewer designed by professor Stephen F. Jacobs of the University of Arizona. The vast majority of lights, including the sun, fire, and incandescent light bulbs, give off a continuous rainbow spectrum. But some lights have distinct patterns: lines rather than fades, unusual color distributions, and/or breaks in their spectra. The card contains a key to unlock each unique rainbow’s information. Rear of card (left) listing spectra on front (right). Note viewing hole with diffraction film at bottom right. Click to enlarge. The card lists 9 different types of light signatures. So far, I’ve found five. I will update this post as I find the others. Incandescent light bulbs have a “continuous spectrum” that looks like a solid rainbow where one color fades into another. The first light I looked at through the Night Spectra Quest turned out to be incandescent. This is a light that shines from the parking lot next door onto my pillow all night; i.e., right into my eyes. Though I was hoping for a more interesting spectrum, turning it into a rainbow felt like befriending an irritating neighbor. Fluorescent lights have both a continuous spectrum and a “line spectrum”. Note the light blue in the middle of the dark blue, and the blue in the middle of the green. It was with this photo that I discovered that standing off to the side could pop the rainbow out like a hologram. The first and most common “line spectra” I’ve seen that can be decoded with the card is metal halide. It has a gap in the yellow, but isn’t missing its purple like the sodium lamps. I thought LED lighting was replacing old gas discharge lamps, but I have noticed several metal halide lamps on brand-new buildings. Neon, in its purest state, is red and has a red and orange spectrum, making this cross as well as the shape of the storefront window come alive in a holographic and totally otherworldly manner. The small, continuous rainbows that pierce it are probably from a string of small incandescent or LED lights reflected in the window. 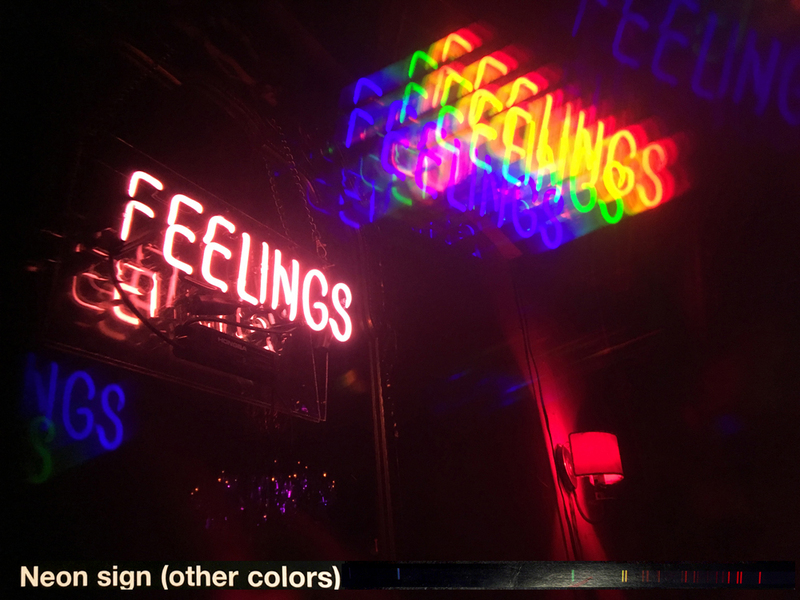 Most colored neon has lots of close-together reds and oranges, a nearby green, and a distant blue and violet. While out with friends, this sign prompted me to pass the Night Spectra Quest around for everybody to see. One friend imagined getting a stack of cards to have on hand to give out. She thought it could help someone who was having a bad night, and I agree. Starline Social Club, Oakland, CA. Visiting such a psychedelic world made me wonder what life would be like if this phenomenon was natural, either on an alien planet or built into our eyes. During the day, it would be overwhelming to see rainbows along with all of the other colors and so much light. But at night it would be glorious. All photos by Emily Wick unless otherwise noted. This entry is part of my Learning How To See project: my quest to see the world differently and find what is hiding in everyday life.